Tip jars stress me out. They wink at my wallet, from unusual crannies, not excluding public restrooms. I feel pressure, when peeing, whether I will tip the attendant, when she hands me a towel. Anxiety rises to the brim, when paying for coffee. 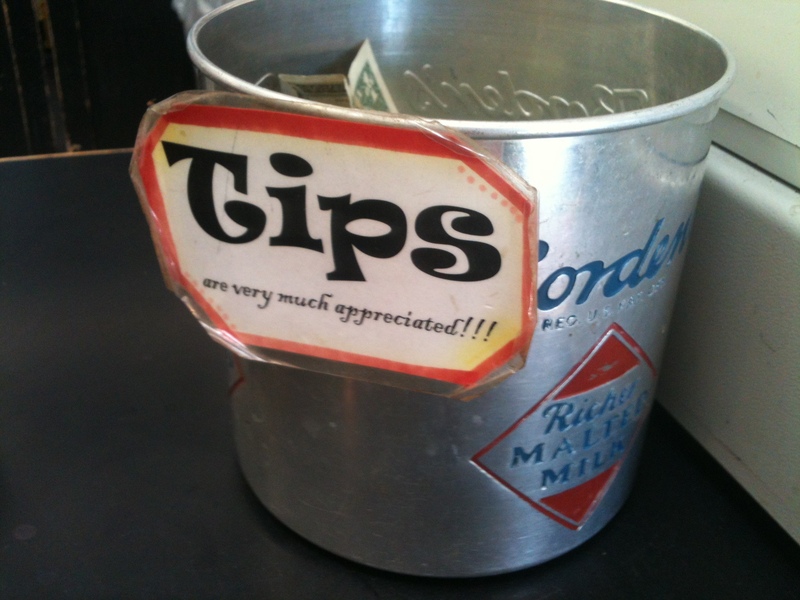 Do I tip all my change, or stay true to my finances? My jobs provide perks, over fluffy checks. I have a pennies worth desire to climb corporate ladders, of assumed financial stability. I have seen folk with Benjamin deficit, when the market tanks, and fold like a bill when selling homes, which were rarely a depreciating asset. 24 hour European treks, priceless ski days, afternoon naps in dollar green grass, and flexible work schedules. I don’t save nickels for homes, or sparkly coins. In a frugal, airline employee style. If I waited until retirement, it’s possible my dimes may not fall in a row. Perhaps, it not a recommended financially intelligent way to live, only tooth fairies know how long our quarters will glisten. I cannot ignore tip jars advertising for college. College shaped me. I wish everyone to experience such opportunity. I understand the flip side of this tricky nickel, remembering my path, distinctly teetering, like a spinning coin, over which avenue to choose. I had little desire to spend additional time, calculating at a desk, until I was crammed, like a sardine, in our green and wood paneled station wagon, listening to my brothers spark, returning on holiday. It sounded so cool. I could feel his energy. Sense his growth. I wanted that, before I could pinpoint what it was, on an intellectual level. Exploring Alabama, meandering to a beach, (my 49th visited United State!) I slowed my wheels, to purchase sunscreen. A little boy was sitting in extreme heat, with a plastic Halloween bucket, asking for change. It broke my traveling heart, looking into the face of such a young boy, asking so politely, with southern manners, and drawl. Homeless hold torn signage at intersections, making me feel awkward, like crying during a Lifetime movie. Charity tins, at drug stores, with childrens’ photographs, unzip my change purse. Local fire departments scoop change from my dash, into oversized plastic boots. Can you say no to cute firemen, with shiny engines?! Knowing how tricky it is to support oneself, if I can’t tip generously, I envision the employee, hungry, hoisting a baby upon their bony hip. Moral dilemmas remain ajar, most everywhere I venture. I prefer European style. Pay what the bill says. Period. No pressure, no math, no qualifying work quality. Simply, no added stress, following an evening of local fare and laughter. I am generous when it comes to dining tips, but when handed an empty, environmentally unkind plastic cup for coffee, do I owe you for your efforts of simply moving your arm? Charity disbursement is confusing. I’m not sure who is legit, or whom I am truly helping. Tell me friends, what side of this coinage conundrum do you find yourselves? I get overwhelmed. I feel your pain. I also get stressed when I see a tip jar. And you live it up girl!!! Travel away. I live your travel stories. I live my travels through your words. Dori-o, you’re such a faithful reader, thank you!